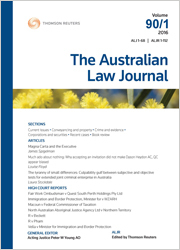 As one of the oldest and most cited legal journals in Australia, The Australian Law Journal (ISSN: 0004-9611) is the pre-eminent legal journal covering a spectrum of all the important current and historical legal issues. First published in 1927, each monthly Part contains the “Current Issues”, “Conveyancing and Property”, and “Recent Cases” Sections, along with a number of other informative and interesting Sections, as well as two or three articles written by leading legal practitioners, academics, and prominent members of the judiciary. The ALJ is also available on the Thomson Reuters ProView™ eReader platform, for fast and flexible access on your iPad®, Android® tablet or computer.